Internet in Namibia has been shaky at best, despite being one of the most westernized countries that we have visited so far. I almost feel like the “Africa” portion of my trip has ended, even though I will be doing a township tour on Wednesday that will surely change my mind. As a result of the poor internet, I have been unable to update, despite having lots to say! So this entry will be extremely long and probably written over the next few days. My aim is to be caught up by the time I leave Swakopmund (Thursday morning) so keep on checking for new updates throughout the week. We are then moving on to a few bush camping places in Namibia, and I won’t have time to update then… so I had better get on it! There are so many truck companies that tour around Africa, it is unreal. Acacia, Africa Travel Company, Kamuka, the list goes on and on. But the best thing about Oasis is that they take you off the beaten track, searching for the small places and activities that make a trip like this worthwhile. One of those places was the D’Kar campsite on the edge of the Namibian-Botswanian border. The D’Kar campsite is part of what Oasis calls “community-based tourism,” where what we are doing (travelling, enjoying ourselves, learning about cultures) benefits the communities we visit. D’Kar is a bushman or “san” community, and while we were there we were introduced to the truly ancient bushman culture. D’Kar is also home to a brand-new archeological discovery, so new that they have only just applied for funding to truly excavate the area. The discoveries made there will change the course of human history — the stone tools prove humanoid civilization existed in this part of Africa for 3 million years. Not only that, but we got to seriously interact with the tools… touch, play, feel… artifacts that would be found behind three inches of thick glass in the British Museum. Another highlight was the bushmen dancing and storytelling. Their language is made up of a series of clicks, which help to form the words. It adds a whole new dimension to their stories. Like Native Canadian or Aboriginal stories, many of the bushmen tales were creationist and animal-based, such as how the ostrich came to have a long neck or how the jackal burned his back. It is also not often that we have to watch for scorpions as we sat around the fire… but it is a local hazard and we all had to watch our feet and our shoes. Etosha is the national park of dreams. 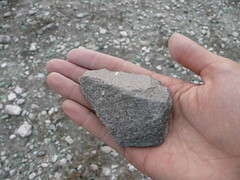 It is made up primarily of a huge clay pan called the Etosha pan. 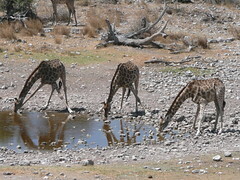 There are many waterholes dotted around, where the animals congregate during the day and at night. Three campsites are situated right inside the park around floodlit waterholes; we stayed at two of them during our visit. This part of Namibia is hot and dry. The game drives in the truck lasted for over 8 hours each day, and despite the stunning scenery and incredible game viewing, few of us lasted until the very end. Still, there was nothing better than sitting in the front of the truck with our driver, pair of binoculars in hand, staring at the panoramic view of game. Giraffes became boring (how is that possible? there were just so many of them…), springboks “pronked” across the road, lions lazed in the sun, everywhere there was game and birds galore. The second waterhole we visited gave us the best night viewing we have experienced, bar my lion stalk in Antelope Park. Waiting from 8pm until well past midnight, we saw jackals and a lone giraffe, as well as lions and rhinos. Game viewing requires a lot of patience. But there is nothing better than being the first one to spot a silhouette in the darkness of the elegant neck of a giraffe, waiting as it slowly approaches the waterhole, steps back, approaches again before bowing down to the water. For pictures of the giraffes in Etosha drinking, be sure to visit my flickr site (link at the side) for a view that few words I can come with can describe. Although cheetahs seem to be relatively rare in the national parks, in farmland Namibia they are considered to be pests. Farmers are known to shoot to kill without hesitation if they see a cheetah approach their livestock. One such farmer shot a cheetah on his farm, only to discover that was survived by three newborn cheetah cubs. The farmer and his family took these cheetah into their home and raised them as pets. Now, the farm is a sanctuary for cheetahs found in Namibian farmland. Instead of being killed, the cheetahs are brought to this place and taken care of. The cheetahs in the house are as domesticated as large cats can be, and we were able to approach them and pet them, just like we did with the lions in Antelope Park. Maybe its due to their litheness or their speed, but cheetahs are much more scary than lions. They seemed less predictable, to be sure. But we all took some photos, before going out into the sanctuary to watch the wild cheetahs being fed. Some people have the most insane jobs in the world. Two guys jumped off the pick-up trucks we were standing on with a garbage can full of meat and large sticks. Five or six cheetah growled and snapped all around the trucks, the guys barely staving them off with their sticks. Then they would throw the meat into the air, to be caught in hungry mouths. The cheetahs did live up to their speedy reputation, bolting once they had captured their piece of meat so that it couldn’t be stolen away. It was a close encounter with an animal we have yet to see in the wild, and it was refreshing to see another example of conservation tourism at work. Spitzkoppe is a giant outcrop of rock in the Namibian desert. There were more rock paintings here which I ventured out to see, and I climbed the closest outcropping of rock with Eric and Amelia to watch the sunset. It was the first night since we left Victoria Falls where we didn’t experience rain and thunder. Therefore, it was the perfect night to sleep out under the stars. I have never seen a sky so huge as that night. Shooting stars fell all around us, passing straight overhead or in the corners of our peripheral vision. The night was cold, but comfortable wrapped up in our sleeping bags and lying on our roll-mats. Namibia is full of contrasts and truly wild beauty. Again, we feared snakes and scorpions, but we all survived the night… even if we didn’t sleep through the night at all. On our way out of Spitzkoppe, we stopped at Cape Cross on the Atlantic Ocean. Here, we visited a giant group of seals, who stop here on their way north. The seals were everywhere crowding the beach and the smell was just immense. We watched them frolic and fight, and try to protect their babies from the hungry jackals which kept circling the area. The ocean was freezing… only a few brave (or stupid?) souls ventured out into the sea. They lasted a few seconds before running back out again into the warmth of fresh towels. Yikes! Just as Vic Falls is an adrenaline capital, so too is Swakopmund. Here, the contrast of scenery is truly visible. A seaside (or oceanside?) city, Swakopmund enjoys both the quaintness of a German town with the action-packed thrills of Victoria Falls. The dunes are right on the doorstep and they are known as the playground of Namibia — the government has donated a lot of money in order to allow for plenty of ‘sand tourism’ while preserving the delicate and unique ecosystem. The first activity that I did in Swakopmund was sandboarding! Due to my severe dislike of snowboarding, I decided to stick with the lie-down version. There is almost no learning curve and you get to have fun straight away! The boards are basically constructed of thin formica with a very smooth flat surface for sliding on. The guide positions you onto the board with only one piece of advice – don’t move a muscle. Then he lifts your feet over the edge of the dune and you fly down the side of a massive sand mountain! We started off small, but by the time we reached “Dizzy,” the monster hill, I was hitting top speeds of 77km/h. The fastest of the day was 79km/h. As with the gorge swing, it was the gruelling climb back up to the top that was the worst part of the day. Climbing sand is no easy feat, especially with the wind whipping the boards around your body. But the adrenaline rush is worth it, and so is being out amongst the dunes. The dunes are just incredible. They are the stuff of pure desert imagination. After that, we decided to get an even better view of the dunes by skydiving! Namibia is one of the cheapest and most rewarding skydives in the world, due to the fact that you get to appreciate the massive sand dunes, the sparkling blue Atlantic Ocean and the Swakopmund city scape. I was the very last person to go up in the plane, after watching people in our truck jump for over three hours. To say that I was trembling with anticipation is severe understatement! I jumped with a camera man to film my wild adventure and had the absolute time of my life. The freefall lasted 30 seconds. To be honest, I never expected skydiving to be so incredible peaceful. Under the canopy, I had a full five minutes of flying like a bird, enjoying the view and chatting with my guide. I even got to fly the canopy for a while, learning how to steer and shift in the air. The landing was tip-toe gentle, and the photographs are fantastic. I wanted to do it again in an instant, and was bursting with envy for the guys who get to jump ten times a day. The next day (as if there could be more!) we ventured back out into the dunes for some major adrenaline fun — quadbiking. I chose an automatic bike (although I would STRONGLY recommend semi-automatic bikes if anyone out there gets the chance to do it!) and we zoomed around the dunes for a good two hours. The views were… unreal. And getting to ‘rollercoaster’ (drive up and down the side of dunes, often close to vertical steeps!) was amazing. Your elegantly written journals are the perfect remedy to a bout of the travel bug. Despite being very happy to return home after a dangerous and stressful month in Soweto, a part of me yearns for that excitement still. I miss that feeling where everyday is a new adventure, and every adventure is once in a lifetime. From your stories, it seems like you are getting 120% of every moment and I am so jealous/proud of you. Our experiences will have some similarities and some vast differences, I can’t wait to share stories. Keep safe, and rock on! Apartheid museum, Cradle of Humankind (Sterkfontein), Soweto tours (make sure its safe).